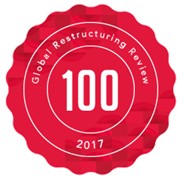 The firm is pleased to announce that it was selected for inclusion in Global Restructuring Review’s “GRR 100” survey, an annual guide to approved law firms for cross-border restructuring and insolvency matters around the world. The competitive rankings are determined based on a number of selection criteria, such as the size of the firms, the clients they attracted, and the value and volume of recent cases they worked on. For a full list of the rankings, click here.